Mount Qingcheng and the Dujiang Irrigation System comprise the intellectual and spiritual centre of Taoism and an ancient water management system that has survived up to the present day. As early as the Qin Dynasty (221-206 BCE), Mount Qingcheng was recognized as one of the eighteen sacred mountains and rivers used for sacrificial purposes. The eleven Qingcheng Taoist temples can be compared to the Ancient Building Complex in the Wudang Mountains, but the former have a simpler style using the traditional architecture of western Sichuan and are considerably older. The origins of the Dujiangyan Irrigation System date back to 256 BC, when the provincial governor Li Bing set up an irrigation scheme to the counter the devastating flooding caused by the Min River. His system makes subtle use of the local topography. It splits the Min into an inner flow for irrigation and an outer channel for flood control. The original system has been preserved, but modern building materials and technology have been utilized to enable this ancient system to conform with the requirements of the present day. The night before I visited Dujiangyan, I had dinner with an Australian girl that I met earlier that day. She planned to go horseback riding in Songpan, a four day trek. “I’m going to visit an irrigation system tomorrow” is what I told her. “It’s an ancient one”, I added. But I already lost her interest. Sometimes it’s hard to explain being a WHS traveller. I really did look forward visiting this site though, wondering what would be there to see. And I don’t like horses anyway. The next day I took a public bus to Dujiangyan, a city about 60 km to the northwest of Chengdu. At the city entrance there’s a most amazing sight: a huge rock (measuring at least 150 x 30 meter) with a golden horse statue on top, and a sign “Top Tourist City of China”. Well, for sure I wouldn’t be the odd visitor here. Direct tourist buses to Mount Qincheng are available from the city's modern main bus station, but I opted for city bus #4 to the irrigation system. Anticipating this visit I had had visions of muddy fields, me being the only visitor trying to find my way and pick up at least some of the story. 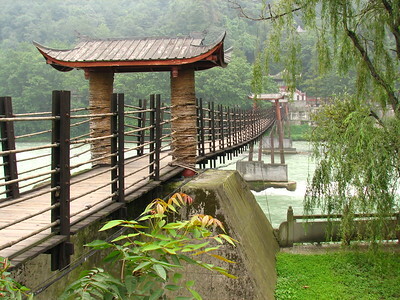 The entrance to the Dujiangyan Irrigation System however looked like one for a theme park. A well signposted hiking route leads you through the park and its main sights. It’s quite a walk, but you can also hop on one of the golf carts that shuttle passengers. The site even has signs in German! Although I must say that the explanations lost a lot of depth in the multiple translations, 10 sentences in English usually resulted in 3 German sentences. It’s rather difficult to make a water management site attractive to a non-specialist visitor. The Chinese have made the most of it by including a park with a water theme, large explanation signs at the points of interest and maintaining some shrines dedicated to the victims of the floodings and to Erlang Shen, a Chinese god with a third true-seeing eye in the middle of his forehead who helped Li Bing with his work. Highlights for me were the Erwang temple and the Anlan Suspension Bridge. P.S. November 2007: I did visit the other half of this WHS (Mount Qingcheng) at the end of my trip around China. I focussed more on its natural features than on the Taoist heritage. See my review of the Sichuan Giant Panda Sanctuaries for that. My first impression while I stepped out from my bus to the gate of Dujiangyan was irritating, it was a very fast 60 kilometers high speed train ride from Chengdu North Station to Dujiangyan city within 35 minutes, but the bus from the station to the site was maybe one of the slowest buses that took exactly 35 minutes for just less than 6 Kilometers without bad traffic! However when I started to look around I was starting to impress the area. I did not enter Dujiangyan Scenic Area immediately but decide to see the old town area which has been rebuilt after the earthquake. The old town was very nice, the most impressive structure was the big covered bridge built in Sichuan architectural style with extravagant details. Then I entered into the scenic park, the park was beautiful with small fountains, Chinese gardens and shrines. I walked along the river and had a good time by looking forts and pagodas on the cliff top on the opposite side of the river. I walked until I reached the suspension bridges and found that there was a dike restoration with many dozers tried to strengthen the ancient dikes. Since there was nothing much to see, I crossed the suspension bridge to another side of the park. This area called Yulei Scenic Park. I saw the famous Erwang Shrine, which was maybe the biggest shrine in the scenic area. After shrine I walked along the river until I reached a pathway to Yuleishan Peak. It was a nice easy walk; along the hiking route I saw two gate forts, viewing pavilions and many shrines with lovely view of Dujiangyan scenic area, Mount Qingcheng and the whole city. At the end of hiking route was the beautiful Shidian Shrine or ten room shrine, this shrine was very unique with its design as two galleries act as a gate to the main city shrine on the hill with amazing roof decoration making this place to be my favorite spot in Dujiangyan. The way finally leaded me back to the old town and the big bridge. Dujiangyan was a nice place to walk around; the genius design of irrigation system was hard to appreciate, but I could not deny it uniqueness among the list of World Heritage Site, also I started to like Sichuan vernacular architecture, so making Dujiangyan, a fine site to spend half a day. the trip was for Mount Qincheng for my second day in Chengdu , i rented a mini van to head there . Going there ,We were diverted to the rear of the mount , since the road heading to the front of MT Qincheng was close, i talked with the lady in the ticket counter in the Rare entrance and she told me that the view in the front was totally different on the scenery at the back, anyway , she said the entrance ticket was cheaper at the back at 20 yuan compare to the front entrance ticket which is 90 yuan , i guess WHS should divide this in to three site, 2 for mount Qincheng ( front and back ) and 1 for Dujianyan , and i should be back again next time, since the front entrance was not open. ahh by the way , after the second cable car and your still heading up White cloud Temple, there will be a cross trail , there will be two confusing direction going up, This is after the destroyed hostel, there will be two sets stair on the cross trail, one with arrow going up to the white cloud temple, while the other is heading down also going to the white cloud temple, go to the route down , since the stairs going up, you will discovers its not an easy trail going up, is NOT Climbable, they must have been destroyed by the Earthquake on 2008. there is actually no visible trails. this is the third day in Chengdu and i was a little apprehensive , if my stay in Chengdu will give me enough time to visit the Dujianyan Irrigation system , since my main purpose to Chengdu is the Leshan DAFU , the Dujiangyan was full when i was there, but most of the people who went there that day were locals, the place was more of a garden park rather than a site , it is well maintain, with fancy shops located along the way inside the park, there is a corner stall that sell statues, that also have several TV explaining how the irrigation system works,in several language subtitle . I hired a car (busese are also available, but it's local Chinese)from Chengdu, the jumping-off point for Jiuzhaigou and Tibet. While there, also cover the museum at Sanxingdui, which features larger-than-life bronze statues and figurines from the lost civilization (3-4,000 years old)discovered accidentally. We are talking about 1.5 meter bronze masks with eye-stalks a la Star Wars. 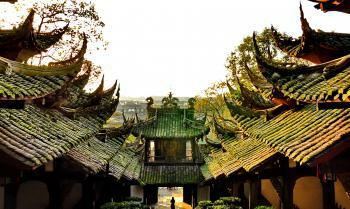 Also within a day's drive is Dazu and Emei Shan. So by staying in Chengdu, I was able to cover 5 WHS (add Jiuzhaigou and Huanglong) in one week. I will fill in the photos later from my Apple. 3.5: Luke LOU Peter A. Destroyed or damaged by Earthquake: The May 12th (2008) earthquake has dealt a blow to tourism in the city of Dujiangyan. The quake damaged some of the most famous historic sites, including the ancient waterworks of Dujiangyan. A month later, efforts to repair have paid off, as a handful of the historic sites have reopened." Tea Horse Road: Dujiangyan claims to be a part of tea horse road, as the caravan stopped in the old city and paid respect to city god shrine in Yuleishan, a part of Dujiangyan Scenic Area. Cultural sites rejected for Natural criteria: "The Committee discussed the question of inscription under natural criteria, a proposal for the construction of a dam by the water conservancy project and the issue of sacred mountains in China. The Committee noted that Mt Qingcheng is considered to meet natural criteria (ii) and (iv). However, it decided to defer the nomination under natural criteria...."